A manufacturing plant may be looking for a way thattheir radio users can communicate clearly with their handheld radios in a loud environment, whereas a retail store may need discrete communication option so customers will not be distracted from their shopping experience. This is where two-way radio accessories come into the play. 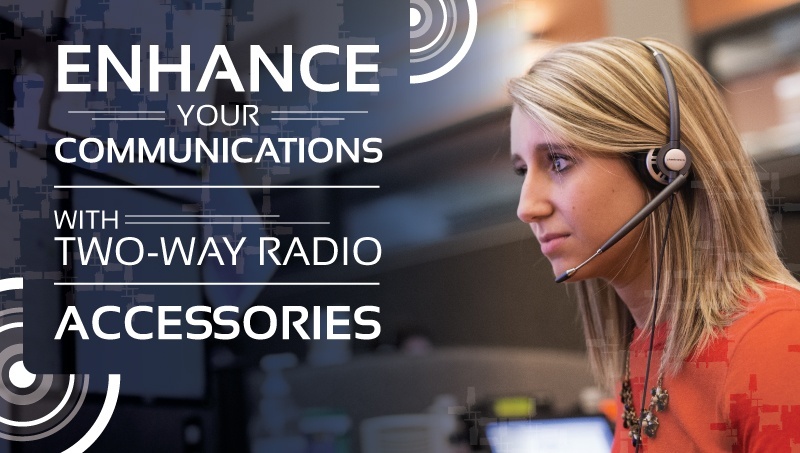 There are many different types of radio accessories, and in this article, we are going to explore the most widely used accessories for businesses and the benefits they offer. Click here to view our entire selection of Accessories. You can then use the filters on the left side of the page to narrow down your search. Most professional radios come equipped with a removable antenna. This gives users the ability to customize their radios to fit their needs. If users are regularly moving and in need of unlimited range of motion, a stubby antenna may be the answer. It is much smaller and less likely to get caught on clothing and objects. If longer transmit and receive range is the end goal, a taller, whip antenna may be the solution. Radio waves use line-of-sight principles, so the higher the point, the farther the reach. 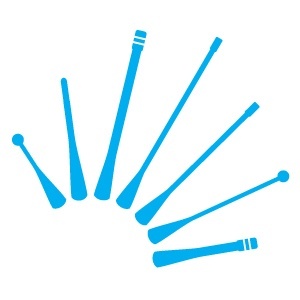 Click here to view our entire selection of Antennas. 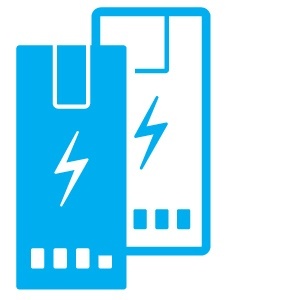 Batteries are a necessity for two-way radios, and most carry enough juice to power a radio for 8-10 hours, but of course, they will eventually need to be recharged. This can cause problems if a shift runs into overtime, or if first and second shift share the same radios. There are several ways to help resolve these problems. The first is have at least one backup battery per radio. This will ensure another 8-10 hours of use in case a radio dies during a shift. There are also some other types of batteries that can help, such as high-capacity batteries. Most manufacturers create a high-capacity version of the battery for each of their radio models, and these batteries can store up to twice the power from a single charge, delivering up to double the battery life. Many radio models also carry an alkaline battery tray accessory. This is a tray that’s made to fit into the radio’s battery slot, and uses standard AA or AAA batteries to power the radio; a great option for emergency backup needs. Click here to view our entire selection of Batteries. Keeping radios organized and keeping a steady charging system can be a difficult task, but multi-unit chargers can help. 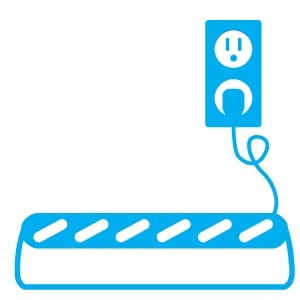 Most multi-unit chargers have enough space to charge 6 radios at once, allowing users to charge 12 radios with a standard wall outlet instead of just 2. This can help tremendously when building a charging station to act as the hub for any radio fleet; keeping all charging in one location to improve organization, regulate charging cycles and help with user accountability. Click here to view our entire selection of Chargers. Earpieces are the ultimate tool for radio discretion. Instead of radio transmissions being broadcasted through the radio for everyone to hear, they keep the radio traffic only in the ear of the wearer. 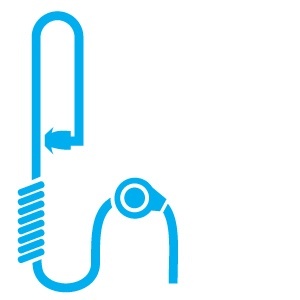 So, if the work environment needs to be kept quiet or if the transmission information is user sensitive, earpiece accessories are the best option to achieve these goals. Earpiece radio accessories are lightweight and do not draw attention to themselves. There are many different types of earpieces designed to fit different needs; single-wire, double-wire, D-style, surveillance, etc. If you need help choosing the one that’s right for you, CONTACT ONE OF OUR REPRESENTATIVES and we will gladly help! Click here to view our entire selection of Earpieces. These radio accessories are not as discreet as earpieces, but they do keep radio messages in the ear of the wearer only. 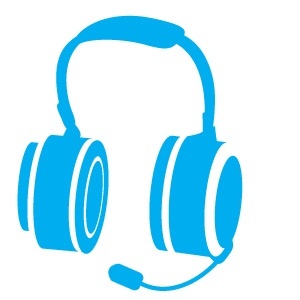 Many headsets come with VOX technology to offer hands-free operations, and they typically come in two different styles: Light-Duty or Heavy-Duty. Light-duty headsets are lightweight and smaller. They are ideal for office workers and dispatchers who need the ability to talk with radio users, but still need their hands freed up to continue to work efficiently. Heavy-duty headsets are built for rugged wear and for use in high-noise environments. They are ideal for factory or construction workers who need to eliminate outside noises so they can have clear radio communications while getting the job done. Click here to view our entire selection of Headsets. If the noise level at a workplace varies, speaker mics are the best choice for a radio accessory. 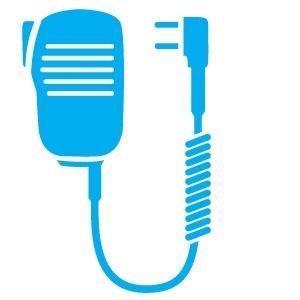 These devices connect to the radio and are typically near a collar or strap close the user’s shoulder to broadcast and receive messages at the wearer’s ear and mouth. This gives the user the ability to hear radio communications at a low volume in a quiet workplace, and to turn up the volume to still hear transmissions as noise levels rise. Speaker Mics also keep users from having to remove their radio from their belt anytime they need to hear or send a transmission; reducing the likelihood of drops and potential that could cause damage to the radio. Click here to view our entire selection of Speaker Microphones. Professional two-way radios are an investment that needs to be protected to ensure long-life and proper function of the device. Individual carrying cases can help protect the radio against everyday wear, dirt, dust and scratches; keeping them in excellent operating condition and extending the life of the radio. Hard, travel cases are also available if radio fleets need to be moved often; from jobsite to jobsite. These cases can typically hold 4-6 radios, depending on the size, and can have foam lining custom-cut to fit specific radio models; ensuring maximum protection of the units during transport. Click here to view our entire selection of Cases. Having someone on staff who can perform basic radio software upgrades or program new radios to match the existing fleet can save money on professional programming and can get the radios updated quicker and back into use. Programming cables and software are available for each radio model, and we even offer one-on-one training sessions taught by our professional Motorola-Certified radio technicians for those that are new to programming and are interested in learning! 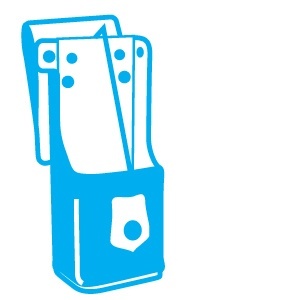 Click here to view our entire selection of Programming Accessories. If there is an accessory that we did not cover, CLICK HERE and view our entire radio accessory collection. You can then use the filters on the left side of the page to narrow down your search.